Hi Ann. We do Cowie Primary uniform but our ties are elasticated, not clip-on. Hi can you tell me if you do Bannockburn nursery ? Hi, yes we can do that. Best to call on 01786 447707 or pop in for sizing. Thanks. Hi, yes we have an order from them to go to the school before term starts. Our sweatshirts are £8.25 and polos £7.70. T-shirts are £5.00. Hi Gill. You’re probably best to call us on 01786 447707 or pop in for sizing. Thanks. Looking for carron primary nursery t shirts. Do you have anything in stock? Hi Neil, thanks for your message. We don’t carry stock I’m afraid, what did you need? Hi, sorry we didn’t reply yesterday, we were too busy in here with school starting back. We only have 2 24″ sweatshirts in stock. Check with the school as we delivered a stock order to them on Friday. 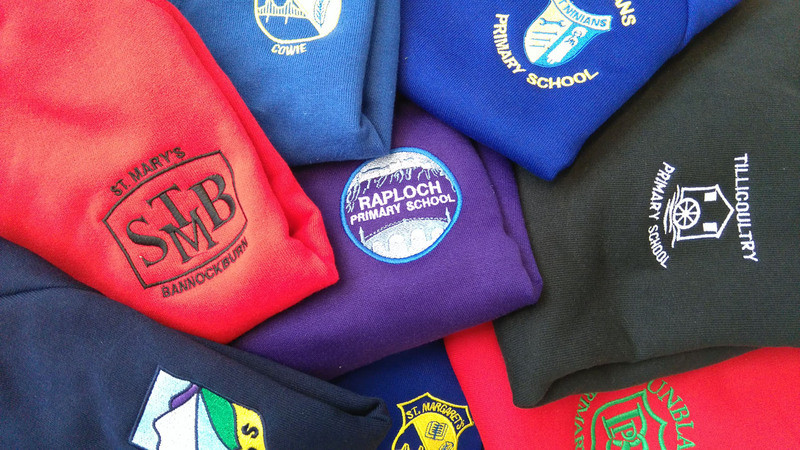 Hi do you do raploch primary school jumpers.